There are several species of cockroaches throughout the United States. Click on your roach below to see more information on identification, pictures, habits, and recommended products and procedures. 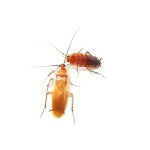 You will find descriptions and recommendations for control of the more common household roaches including The American Roach, Oriental Roach, German Roach, and the Brown Banded Roach. The American and Oriental Roaches are often referred to as ‘waterbugs’ or ‘palmeto bugs’. Cockroaches are under the order, Blattodea. The German cockroach is the most prolific of the roaches. It is small, dark brown with two distinct black stripes on its thorax. Consider non-repellant insecticides or a fantastic bait such as Alpine Roach Gel. Pheromone traps will help you monitor your progress. Size: Up to 2 inches long. Color: Red dish brown. The American cockroach is the largest cockroach that infests buildings in the United States. The American cockroach is called the “palmetto bug,” and it is also referred to as a “water bug” throughout the United States. Size: Both male and female are about one inch in length. Color: The female is all black, while the male has two brown wings. The Oriental cockroach is a pest in homes throughout much of the United States and is often referred to as a ‘waterbug’. During the summer, oriental cockroaches can be seen outdoors where they may venture into neighboring buildings. During the colder months, they reinvade homes, establishing themselves in basements and crawl spaces. Like all cockroaches that invade buildings, this species prefers to spend much of its time resting in cracks and voids. Most of its activity will occur at night when it feels safe to move about in search of food and water. The brown banded cockroach does not seem to require as much moisture as German cockroaches, and therefore may be found in rooms other than kitchens and bathrooms.